(MENAFN - Newswire.com LLC) DENVER, January 30, 2019 (Newswire.com) - Rev. Leon Kelly, Executive Director of Open Door Youth Gang Alternatives Program—the oldest anti-gang program in Colorado—was out on the streets for Denver's Martin Luther King Day celebration as he has been for the past 31 years. 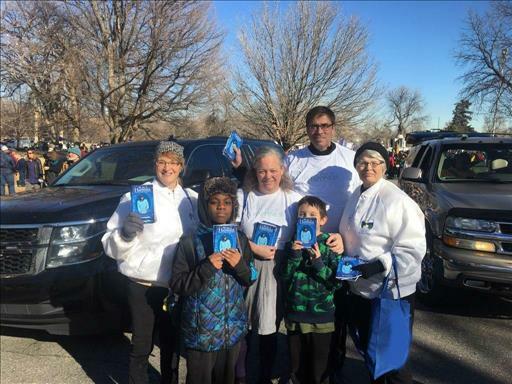 He was joined by volunteers from the local chapter of The Way to Happiness Foundation who handed out copies of a special edition of The Way to Happiness featuring Rev. Kelly on the cover. For the past 35 years, Rev. Kelly has been working to keep kids off the streets and out of gangs. As gang violence in Denver accelerated and the numbers of victims of gang violence continued to climb, Rev. Kelly realized 'the only way to really kill a gang is to cut off recruitment. In order to break this cycle we have to deal with them at an earlier age before they are engulfed in this mindset.' When he was introduced to The Way to Happiness he saw this simple guide to better living as a way to get through to young people. With precepts (a general rule to guide thought or action) such as 'Don't Do Anything Illegal,' 'Do Not Harm a Person of Good Will,' and 'Try to Treat Others As You Would Want Them to Treat You,' it is a natural complement to what Dr. King preached.